No matter how many theatres, food hubs or entertainment centres open in the city premise, we always crave for more. We need a break from the city life to take a deep breath of fresh, unpolluted air every once in a while. And if you're worried that having such a break is impossible within the two days of a weekend, then we beg to differ! Mandargiri is a perfect weekend getaway since it is located just about 65 km from Bangalore. Mandargiri, also known as Basadi Betta, is a beautiful, round hillock housing a number of Jain temples. It is situated in Tumkur district of Karnataka. 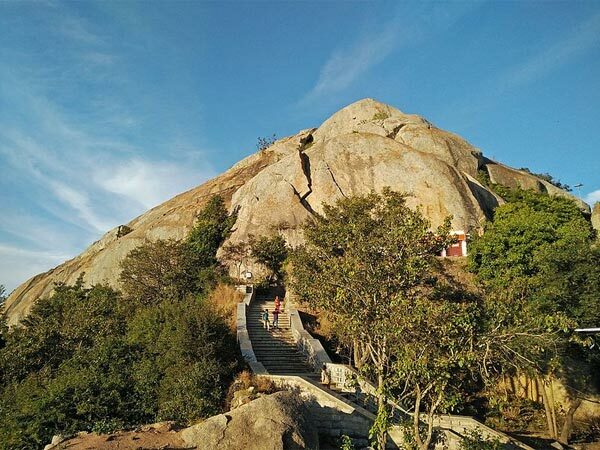 Trekking on this monolith is relatively easy as it has around 460 steps that will take you to the top of the hillock. Mandargiri is surrounded with boulders of many shapes and sizes, a haven for photographers. Mandargiri Hills can be visited at any time of the year for a nice trekking experience. However, the Jain temples are open only during special occasions. You can stop at the following places on the way. Nelamangala is a small town, located roughly 25 km from Bangalore. The town has many temples, and one ashram in Arasinakute. The place also houses the Vishwa Shanti Ashram that was installed by Sri Premaraj Bhajanrangee, as a single platform for spiritual retreats for his disciples. This spiritual site has many temples such as, Gayathri Mandir, Durga Mandir, and an interesting Bhagavadgita Mandir, which has a Vishwaroopa Darshan and all eight verses of the Gita written in various languages. The place also has a Vishwa Vijaya Vittala statue that is 36 ft in height! The name Shivaganga comes from two interesting facts. One, it is said that when you look at this hill from a side, it resembles a Shiva linga. Two, a spring flows in the vicinity, which is locally called as "Ganga". Shivaganga is located in Dobaspete, 27 km from Nelamangala and 57 km from Bangalore. This hill, with a peak of 2,640 ft, is a perfect blend of adventure and religion. The trek is of 2.3 km distance and is made easy with a defined trail, rocky steps and safety rails, therefore, anybody can enjoy this trek. Gavi Gangadhareshwara Temple can be visited, which resides in a cave on top of the hills. Another hill located in Dobaspete region is the Siddara Betta or Nijagalbetta, a much less-explored hill compared to Shivaganga. Many historically significant ruins are spread across the hills. Nijagalbetta Fort, believed to be built by Chikkadevaraya Wodeyar in the mid-17th century, is found here. The peak of the hill offers a breathtaking view of Shivaganga and the beautiful rocky landscape that surrounds it. Trekking here might be a tad bit tricky, since there is loose sand in the initial phase, but the route gets rocky and easier towards the top. Roughly 20 km from Shivaganga, lies the Basadi Betta, or Mandargiri Hills. "Basadi" means Jain shrine or a temple, usually a term used in South India. The term is obtained since a number of temples are situated on the top of the hill. Pinchi-Shaped Gurumandir is located at the base of the hills. It is a beautiful mandir, shaped in the form of peacock feathers, hence the name "Pinchi" (translates to peacock). Opposite to the rear-end of the temple, lies the view of the picturesque Mydala Lake. With a permission from the temple management, an overnight stay is possible on the hills. The serene Mandargiri hill houses a temple complex, consisting of four temples. Two of those are dedicated to Bhagawan Chandranatha and were built in the 12th century BC. The other two are for Lord Parshwanatha and Lord Suparshwanatha each, built in 14th ceuntury BC. Devotees from places visit these temples, and sometimes sit for meditation. As previously mentioned, Mandargiri hills is an easy trek. It has 435 steps that can be completed in a span of 30 minutes as a whole. However, if you wish to have an overnight camp on the hills, you can do so with the permission of the temple owners. Carry water and food since there are no food stalls around the place. The temple office is located at the base of the hills. Before climbing up the hills, you can ask for the temple keys from the office, in case it is closed. The hill station of Devarayanadurga is located 20 km from Mandargiri. It is well-known for Yoganarasimha and Bhoganarasimha temples, situated at an altitude of 3,940 ft.
Namada Chilume, a small spring flows at the base of the hills. The myth tagged with this spring water is that, Lord Rama shot an arrow to the ground when he did not find any water, while he was on his way to Lanka. The ground thus split to make the water flow.